Every year, my family visits a pumpkin patch. We have been to three in Arizona so far in our time living here. 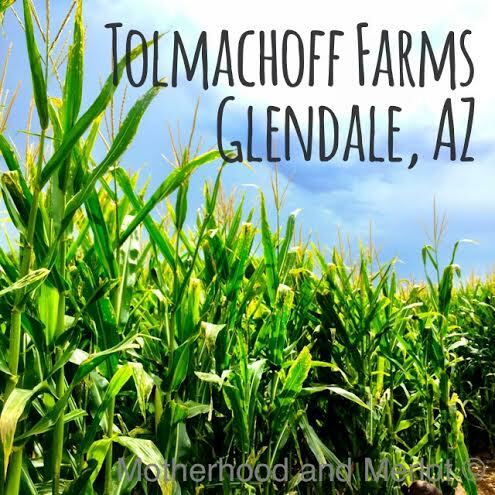 This year, we went to Tolmachoff Farms in Glendale, AZ. I have a slight obsession with all things pumpkin, pumpkin patches included, and now my two oldest girls do as well! We had a blast here and there are a lot of different activities to choose from. I would say that this particular farm in AZ is geared more towards a younger crowd, but there are things for older kids and adults to enjoy as well. My two-year-old was convinced she could pick up all of the big, heavy pumpkins. And boy, did she try! My oldest really wanted a pumpkin, but was more interested in eating the fresh made kettle corn that they sell at the farm. She was actually afraid if she put down her bag, her sister would take it… we are still working on sharing;) The had this “train” ride for smaller kids, which my girls loved. My husband even rode it with our two-year-old. They took them up and down the road by the corn maze, did some figure 8’s, and all of the kids really seemed to like it (well, almost all of them;) ). Seeing animals up close is always something my girls love to do. They had corn that you could grind up and feed to the chickens which was fun. We named this one “Cluckie”. There were horses, baby goats, and a decent sized petting zoo with other animals as well. They had a huge area where you could just buy pre-picked pumpkins. There were also really small ones which my kids just loved! We got four, one for each of them:) They sold all types of fresh preserves, canned goods, and sweets. I, of course, had to try out their 5 pepper smoked salsa. So delicious! We loved spending time together as a family out here, and I think everyone had a good time, regardless of the rain and the mud.